The Fitness Fanatic™ provides the perfect space to get in shape. Fuel your performance with a work out space available when you need it, for as long as you need it. No more lineups for the treadmill and no more excuses. Work towards your fitness goals, find your zen with a yoga routine, or stretch out after a busy week - the Fitness Fanatic™ is ready 24-7. The Best Home Gym is the One that Comes with Your House! If being fit and active defines your lifestyle, your heart will be racing when you add The Fitness Fanatic™ home gym package to your new home! 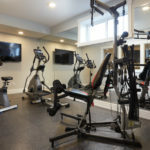 Meet your fitness goals and save money with a 16’ x 12’ in-home gym in your basement.